A gripping mystery of jealousy, murder and lies. An invitation to her estranged, wealthy father’s surprise 75th birthday party in New York sees Amelia and her husband, Jack, set off across the pond to meet a whole new world of family politics. Amelia’s relationship with her father Roger has always been a strained one, caused by her step mother Helen. Helen despised her, and stopped allowing her to visit them in New York. When Helen died the two managed to build bridges and become close again. So when her father announces that he was dating again, Amelia makes a conservative effort to be friendly, and get along with the new woman in her father’s life, Evelyn. Everything seemed to be going swimmingly. Amelia and her husband Jack had even been invited by Evelyn to attend her fathers 75th Birthday party. But not long after touching down from London, the two begin to question Evelyn’s part in Rogers life. Especially when she hires a seedy nightclub, in her fathers worse place in New York, Coney Island, to throw him a surprise party, something that he despises. Amelia determined to stay on the good side of Evelyn, does everything she can to be friendly, but there is only so much you can take when the woman, who is playing the good ‘pretend’ wife to Roger, starts to treat Amelia and her husband like dirt, and tries to turn her father against her, though not in front of everyone else. What is this woman’s motives, and how does she have such a hold over Roger? Gilding the Lily is a slow paced thriller. There is no sense of urgency about the plot, yet the book hooked me in. I was pulled completely into the lives of Amelia, Jack, Roger and Evelyn, and couldn’t wait to see where the story would take me. 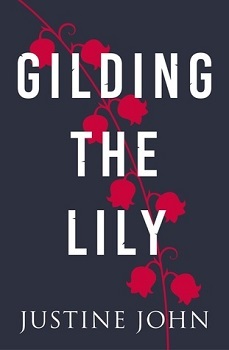 To gild the lily means to give a falsely attractive or valuable appearance to something, and Ms. John certainly chose a title that couldn’t of fitted more perfectly. The book is written in alternative view points of Amelia and Jack, except for four chapters told by two other characters. Written in this manner, you get to delve into both of the protagonists lives deeper, and really get a sense of what each of them are going through, managing to get inside of their heads. The storyline throws a lots of curve balls at you, and it certainly didn’t play out how I thought it would, catching me off guard more than once. It’s not only a thriller, its a book exploring the inner lives of families, and tells a cautiously tale of how it can take only one person to destroy many others. This is the kind of debut novel that holds the bar high for any subsequent novels that follow. After the war ended, I went to my first dance. I met a European boy, Ernie. His family were all due to go home the following year. But their city in Austria had been bombed and devastated. They would stay a few more years. He enrolled into school in Boston and we married while he was still a student. I looked beautiful, of course, and his whole family were there. We lived with his parents at first, but I think they hated me. They sent me off to school so I could learn to be a secretary. I kinda liked it and they told me I would be able to earn a good wage with the skills. They eventually went back to Europe, and we stayed so he could finish his studies, and I did get a job, but as a waitress. It didn’t go down very well, but they gave us enough money to rent an apartment anyway. He did well, graduated, and went straight into a highly-paid job. He worked hard. One night, he got drunk. I wouldn’t put out and he grabbed me by the arms and bruised them badly. I wore long sleeves for an age. It became more frequent and he ended up using my body like a punch-bag about once a month. Around that time, I came across some lily of the valley in the woods. I recognised its beautiful scent – like citrus, honey, and jasmine all mixed, curiously reminding me of spring and happy times. It was May. It comforted me. Ernie died after we’d been married for only two and a half years – a fatal case of food poisoning. It was 1953 and I moved to New York City. It was humming, hectic, alive. Marilyn Monroe and Elvis dominated the theatres and gossip columns. Eisenhower was just in. TVs, poodle cuts, big skirts and Jackson Pollock. Oh, what a time. I was so happy then – free from guilt and rules. I was thankful for the secretary’s course that Ernie’s family had paid for. He had saved a good amount of money, which he kept under the mattress. It was enough to get me started. I never saw his family again – went back to my maiden name and never told anyone that I had even been married. I was 21, the world was my oyster and, well, no one needed to know that, did they?